House Republican leaders have released changes to their healthcare reform bill that seek to please both conservative and moderate members of their party. The changes were mostly designed to win over ultra-conservative members of the U.S. House of Representatives' Freedom Caucus, whose members were threatening to vote against the American Health Care Act when GOP leaders plan to bring it to the House floor Thursday. But some of the new provisions were aimed at allaying the concerns of Republicans alarmed by last week's Congressional Budget Office projections that the bill would make insurance less affordable for people aged 50 to 64 and sharply drive up the uninsured rate in that group. The changes are likely to reduce the federal budget savings produced by the bill, which the CBO projected at $337 billion over a decade. Ways & Means Chairman Kevin Brady told reporters on Monday that an updated CBO score is expected to come before the scheduled floor vote Thursday, after the bill is considered by the House Rules Committee. • establish a work requirement for Medicaid enrollee adults who aren't disabled, elderly or pregnant; states that institute a work requirement would receive a 5% extra administrative payment. Experts say HHS already has the authority to grant states waivers to impose work requirements. • give states the option to receive federal Medicaid funding in the form of fixed block grants not based on number of enrollees, or to receive it in the form of per-capita allocations. • Increase the growth rate of capped federal payments to the states for elderly and disabled beneficiaries by the medical component of the consumer price index plus one percentage point; the growth rate for other beneficiary groups would be the medical component of CPI, which lags behind actual per-capita Medicaid spending by 0.7 percentage points, according to the CBO. • Penalize New York state for requiring some counties to contribute to Medicaid funding. Upstate Republicans wavering on supporting the bill had pressed for this provision – already dubbed the “Buffalo buyout” -- to reduce property taxes in their counties, but hospitals and nursing homes had warned it would lead to big Medicaid spending cuts that would hurt services. Politico reported that the manager's amendment would establish a reserve fund of at least $75 billion for tax credits to help Americans between the ages of 50 and 64. The amendment would not actually set up the credits but would instruct the Senate to do so. The reserve fund is not mentioned in the four-page summary of the amendments. 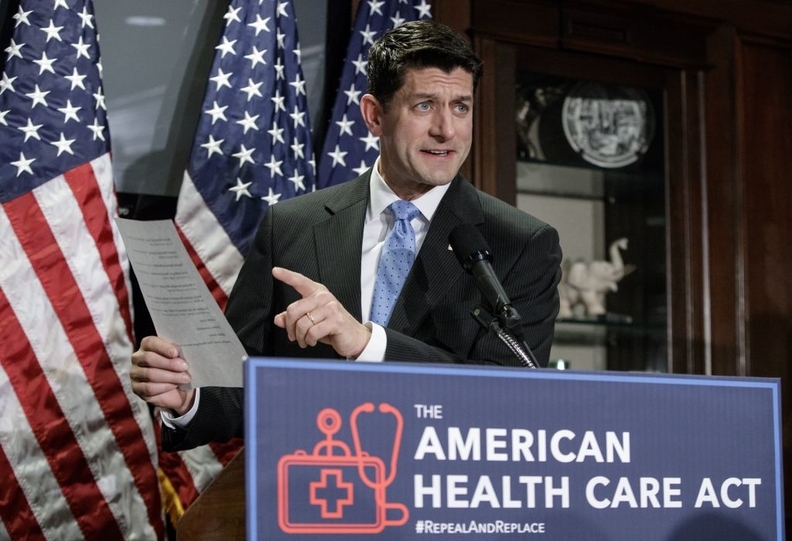 But Joe Antos, a conservative health policy expert at the American Enterprise Institute, predicted that edgy Republicans in the House and Senate are likely to come around and back the bill because this will be the only vehicle for repealing and replacing Obamacare.